When I first moved to the Hood River area my wife and I spent several weekend days driving around aimlessly trying to find somewhere to explore. We had talked with several people who had passionately tried to explain all the glories to be seen in the area that surrounds The Fruit Company. But after multiple hours of directions explained, and eventually forgotten, we gave up with our search. Within a week a close friend of ours was listening to me express my disappointment and failure as a directional specialist (Guy), when he clued me into the best kept secret in the gorge. Curious Gorge. At first I was not interested. Why would I want to read a book with a play on words of a children’s classic? After moving past that I began thumbing through the book. And to my amazement all the information that we had been searching for was laid out in front of me. Organized and including all the facts we needed to know. 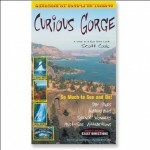 It included directions to many locations all over the Gorge area. All the hiking and biking trails leading to lakes and running along streams explained and rated as to the difficulty of the endeavor. Still skeptical I found a hike that didn’t look too hard. We set out the next Saturday only to find the directions given accurate and easy to translate. After a great afternoon hike I was ready to go buy my own personal copy. So if you’re in the area and looking for things to do that doesn’t involve windsurfing or all the in town amenities that Hood River, White Salmon, and Bingen have to offer I would recommend adding this book to your visit. It’s a little more difficult to find but I did find it at Dog River Coffee in downtown Hood River. If you’re planning ahead of time you can order it online at REI.